I read this article and found it very interesting, thought it might be something for you. The article is called ‘Small Hydropower Projects Turning Rivers Into Series Of Static Water Bodies’ and is located at https://archive.indiaspend.com/cover-story/small-hydropower-projects-turning-rivers-into-series-of-static-water-bodies-75255. 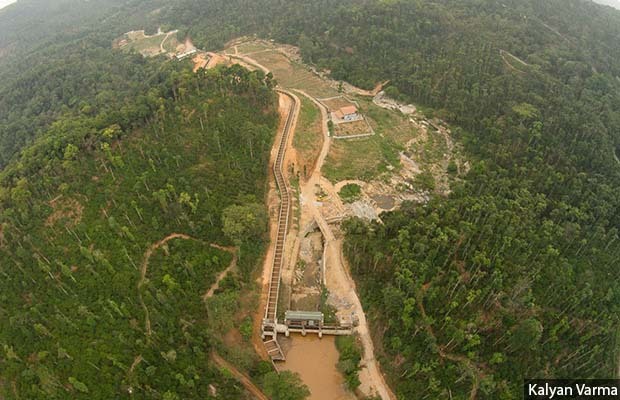 An aerial view of a small hydropower project (SHPs) in the Western Ghats, Karnataka. More than 1,000 small hydropower projects have been built nationwide–and 6,474 more sites have been identified for further development–based on the belief that these projects do not harm the environment and local communities. Mount Abu, Rajasthan: India is promoting small hydropower projects (SHPs)–defined as hydropower facilities of less than 25 megawatt (MW)–on the assumption that they are socially beneficial and more environment-friendly than larger ones. However, an assessment of the impact of two SHPs in the Western Ghats reveals the contrary, according to a scientific paper published in May 2018 in the Journal of Aquatic Conservation, Marine and Freshwater Ecosystems. The study found that SHPs fragmented rivers, altered their physical characteristics and water chemistry and affected fish species. On two stretches of tributaries–with dams and largely without water–of the Netravathi River in the Western Ghats, an area known to be a biodiversity hotspot, SHPs reduced the width and depth of water. In the free-flowing stretch, the width of the stream increased from 9.72 m upstream to 19.14 m further down. 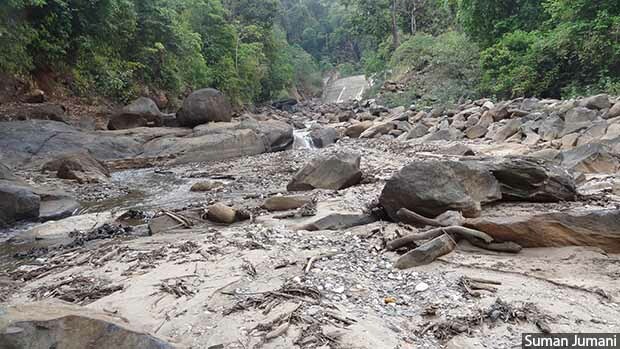 Stream depth also increased from 0.58 m to 0.88 m. In one of the dammed stretches, the width decreased from 7.35 m upstream to 2.00 m after the dam, and the mean depth decreased from 0.38 m to 0.03 m. The leftover water warmed more quickly–especially in summer–decreasing soluble oxygen for freshwater fish. A dry river downstream of a small dam in the Western Ghats, Karnataka. “Bumper-to-bumper development” of rivers–based on the “ludicrous belief” that “surplus” water shouldn’t go waste–is turning them into series of static water bodies separated by long reaches of dry stream beds, ecological scientist Suman Jumani told us. Compared to a free-flowing stretch of river without a dam, used as the control site, the stretches with dams, especially the stretch extending from the weir to the powerhouse, had fewer fish species. Native species adapted to flowing water (rheophilic species) were especially affected compared to what are called eurytopic species, which have adapted to still water. These findings echo those of similar studies worldwide. SHPs led to greater human-elephant conflicts and water- and land-use conflicts with local communities, according to a related 2017 study by Suman Jumani, who believes this evidence builds a case for the government to better regulate the growth of SHPs. “A policy review is urgently needed, given that more than 1,000 SHPs have already been built across the country and that 6,474 more sites have been identified for further SHP development,” Jumani, 29, a senior research fellow with the Foundation for Ecological Research, Advocacy and Learning (FERAL), Bengaluru, told IndiaSpend. Renewable power accounted for roughly a third of India’s installed capacity of 334.15 gigawatt (GW) in February 2018. Of 107.81 GW renewable energy capacity, 4.42 GW or 4% was from small hydropower. While the government plans to increase the energy from renewable sources to 235 GW by 2022, barely 5 GW of this would come from SHPs. This puts the ecological losses from SHPs in perspective. If a review of the SHP policy leads to a cancellation of many proposed projects, it would still not derail India’s renewable-power generation plans, while protecting India’s indigenous flora and fauna. This study came about because Jumani, while pursuing her master’s degree, worked on an assignment related to SHPs in Karnataka. There, this animal lover, who hoped to be a wildlife veterinary surgeon but was drawn to wildlife research and conservation instead “was shocked to learn that these projects do not require any environmental clearance and can be built without any Environment Impact Assessment studies or public consultations”. An SHP would require environmental clearance from a competent authority if it is located in ecologically sensitive or fragile areas, and if the project–in conjunction with existing or proposed hydropower projects–may have cumulative adverse impacts, according to guidelines prescribed by the Indian Institute of Technology, Roorkee, and others, for the ministry of new and renewable energy. 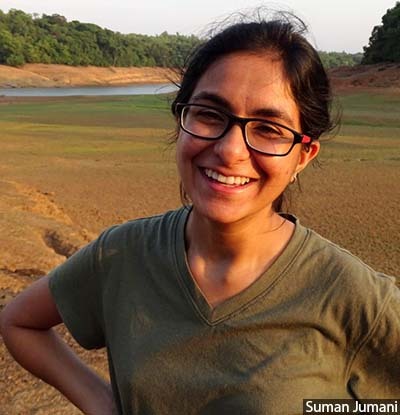 Suman Jumani, a Bengaluru-based researcher, was first drawn to issues around small hydropower projects (SHPs) when pursuing her masters degree. SHPs fragmented rivers, altered their physical characteristics and water chemistry and affected fish species, Jumani’s recent study has found. “Soon after, I also go to know that my professor was working on a court case related to fraudulent SHPs in the Western Ghats of Karnataka,” she said, referring to the case of Maruthi Power Gen Limited, a Bengaluru-based power company that fudged information to show a large hydropower project in the Kagneri and Kanchanakumari reserved forests in Hassan district, Karnataka, as two smaller ones, to bypass environment clearances. “We realised that there was a huge knowledge gap since there wasn’t a single comprehensive study that examined the impacts of these dams in India,” she said. In both the dammed streams in your study, you found low species richness near the dam. This increased with distance from the dam only in the upstream direction, and declined towards the downstream direction. You found fewer juvenile T. khudree (a migratory fish) in the dammed stream. What does this tell us about the behaviour of freshwater fish? Can this damage be reversed? Our study sheds light on the importance of longitudinal connectivity of the water body. Migratory fish such as the mahseer or T. khudree have evolved a life pattern in response to the natural flow of the river. When their habitat is fragmented and reduced, and the water quality altered, they are adversely affected. We found that T. khudree in particular is especially sensitive. Its eggs are vulnerable to desiccation (extreme dryness) and submergence by sediments, conditions routinely experienced in the dewatered stretches of SHPs. The frequent and abrupt discharges in the downstream region affect stable low-flow periods and habitat persistence, which further affects juvenile abundance. Dewatering is known to reduce the breeding success of migratory species such as the mahseer. The extent of this damage can definitely be reduced. In terms of SHP operations, maintaining adequate flows in the river at all times will go a long way towards mitigating these impacts. The efficacy of other mitigative measures such as fish ladders–structures built to facilitate the movement of migratory fish species around man-made barriers like dams or barrages–can also be explored. At the scale of a river basin, SHP development should be better planned to limit the number of dams on a river, avoiding clustering of SHPs, and conserve undammed tributaries within each river basin. However, most of these changes can happen only when the policy changes. By shedding light on the adverse environmental and societal impact of SHPs, your study helps dispel the assumption that SHPs are socially beneficial and have minimal or no adverse environmental impacts. What other erroneous belief system does your study address? Numerous water abstraction projects are being conceived based on the flawed belief that rivers flowing into the sea are a waste of freshwater resources. For example, numerous west-flowing rivers that originate in the Western Ghats and flow into the Arabian Sea have been identified for lift-irrigation projects, water diversion projects, and river interlinking projects. The 108 km-long west flowing Netravathi River itself already has 10 SHPs and numerous irrigation projects. In addition, 44 SHPs, a major water diversion project, a dredged waterway, and a river interlink have all been proposed on the same river. On the ground, this bumper-to-bumper development would mean the tailrace canal of one project empties into the reservoir of the next project downstream. That way, vast stretches of rivers are being transformed into series of lentic (static) water bodies separated by long reaches of dry stream beds. All this is happening because of the belief that ‘surplus’ water should not go ‘waste’ by letting the river flow into the sea. However, this idea is ludicrous. Rivers play crucial roles in maintaining and supporting ecosystems and processes, from their headwaters to their estuary. For example, without the natural flow regime of rivers, excessive salt-water intrusion from the sea could become a serious problem affecting groundwater, irrigation, fisheries, and livelihoods. Through this study, we make a strong case for evidence-based policy. We suggest that sites for new SHPs should be chosen carefully after taking into account the cumulative impacts of already existent projects within a sub-basin. How has the proliferation of SHPs affected local communities in the Western Ghats region you studied? Impaired ecosystems always adversely affect the communities dependent on them. For example, the reduced fish species richness and altered fish composition from the SHPs negatively affected local fishing communities. The fragmentation of the surrounding landscape by SHP-related ancillary structures affected the free movement of wild elephants, and hence increased human-elephant conflicts, thereby resulting in severe losses of crop, property and even human life. The diversion of water for long distances caused direct conflict with members of the local communities, who depended on the same source for their irrigation water supply. Often the effects on communities vary from place to place. Since SHPs alter natural flow patterns, they have been known to directly disrupt culturally important sites, traditional irrigation cycles, watermills and drinking-water sources. India’s commitment to enhance its renewable energy capacity under the 2015 Paris Agreement has further given a boost to SHPs. Their growth is being encouraged by financial aid and subsidies from the central and state governments, and facilitative policies such as being exempt from obtaining prior environmental clearances and partaking in environmental impact assessments and public consultations (as per the Environmental Impact Assessment Notification of 2006, Government of India). Now that your study dispels the notion of SHPs being benign, what changes do you propose to SHP operations and policies to enable the conservation of river fish diversity and mitigate their negative impact on human life? We suggest that SHPs must be subjected to similar licensing procedures as other development projects, and mandatory environmental impact assessments, stakeholder consultations, mitigation efforts through design and operation, and effective monitoring protocols. As things stand, in most states there are no legal obligations for SHPs to maintain even minimum environmental flows. In our field site, the dewatered stretch of the two dammed tributaries had nil or low flow conditions for about seven to nine months of the year. This spells disaster for indigenous fish species assemblages and other aquatic biota dependent on the river. Our results suggest that maintaining adequate ecological flows in this stretch is crucial for mitigating the adverse impacts of SHPs. Consider that SHPs are often located in headwater regions of biodiversity hotspots, and that most SHPs are within ecologically fragile regions, and the call for ecological flow regimes to be considered in SHP operations becomes even more urgent. It is also imperative to identify and conserve a number of undammed tributaries within each river basin. This can help facilitate the recovery of endemic fish species downstream of hydrological barriers. We believe that defining SHPs by installed capacity is flawed, as this is a poor predictor of environmental impacts. Future studies are needed to assess the relationship between environmental impacts and SHP size, gross head and weir height, and length of dewatered stretch to better inform the definition of a SHP in policy. An arbitrary threshold of installed capacity also allows companies to evade regulations by fraudulent practices. We know of instances where hydropower companies work around the cut off by getting independent licenses for two SHPs located on the left and right bank of a river. On the ground, developers build one large dam, producing over 25 MW. Dear Suman……Heartiest congrats and lots of Thanks for this very Imp.study. In-fact we have been wanting someone to do similar in- depth studies on the river Narmada both upstream and down stream of Sardar Sarovar Project.Upstream of SSP is Indirasagar Dam and above that Bargi Dam,the First one of the Series that has practically killed Narmada. The sand mafia with Political & Buraucratic support are extracting sand illegally and the riverbed is drying up and downstream near Bharuch the Sea-ingrase is more than 60 kms. Thus the Fisher-folk have almost lost their traditional Livelihood.The Kalpasar Project in the name of stopping the Sea-Ingrace is actually to divert Narmada.s fresh water to the Industries in Dahej area,that will further Pollute Narmada with their waste water also.The weir being built at Badbhoot will lead to stagnation of water and loss of many Fish species in the Fresh water.Also breeding site of HILSA is getting destroyed. Much as the potential of such useful research maybe, the key question is whether these reach the decision maker and then if at all they make any use to alter / modify policy? This does not seem to be happening and so year after year you have policies being churned out but dictated by political considerations rather than by research.